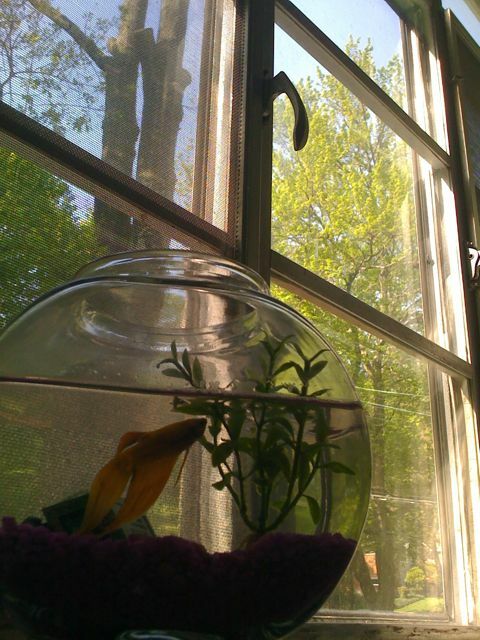 Winny, the third of three beta fishes (and the fourth pet if you count his best friend Fasty, the snail) has died. We are more or less certain that the fatal injury was incurred on a playdate by a mischievous friend wielding a cheap piece of jewelry. Dear Sophia, I'm sorry to say but you stuck paart of the necklise in the fish boll. My fish is dede now. It is not todally your falt. It's my mom's falt too!! Fish water: if you stick something (metle) in the fish water when you take it out, it is dry, that is how fish water works! Daddy: half, in the base of a young but noble elm tree (half still on a bookshelf). (Sadly, the first fish, Goldy, was unceremoniously flushed because he died when I was out of town. But we're regretting that now). Does this all help my daughter understand her great loss -- of her father -- any better? It's really hard for me to say. On the one hand, I think she's overly preoccupied with death. On the other hand, I just read that 7-year-olds tend to be a bit "goth" as part of their internal development. She's certainly not as bad as above mentioned Sophia (who believes that she is secretly a vampire and she keeps her little brother's secret powers in her jewelry box). She hasn't even been as sad as I'd expect after each loss, even though she expresses great affection and interest in each pet. And we are talking about fish here. I mean, fish that she READS TO ("the Night Before Christmas"). Fish that she teaches TRICKS to. Fish that she has tried to get to pronounce the word "FOOD." This kid knows how to love. She invests, even in small scaly things. And she doesn't get real upset, even while blaming me. It seems to me she has grown into her loss -- that she and I are more intermeshed because of it -- but it hasn't stopped her (or me) from attaching to Mr. Fresh. She is so at ease with having had two Daddies. My child is such a comfort and a curiosity. And she is campaigning for a cat. Oh Supa (Robin) what a cute post this is. It sure is interesting watching our kids grieve and heal and how they take a loss. So glad to see the positives! How precious what she teaches the fish. I could see my daughter doing the same things and it makes me laugh and smile to think about what a wonder children are. Thank you so much for sharing this with us..
Oh, wow... I didn't see this before I started writing earlier. I just wrote a 'daughter's dead fish' post, too.